Duke’s second album, released in Ireland in October 2008. This is an album for sleepwalkers, skeletons and gravediggers, for those who have fallen so far down they can taste the soil between their teeth. A more immediate and visceral collection than the previous multi platinum selling Songs From The Deep Forest, the album’s many moments of beauty and hope are juxtaposed with a dark, brooding edge- the trademark twist of the Duke. Recorded between Wapping, London; Champaign, Illinois and Culleybackey, Northern Ireland, ‘I Never Thought This Day Would Come’ was produced by long-time collaborator Paul Pilot and mixed by Nick Terry, best known for his work with the Klaxons and The Libertines. 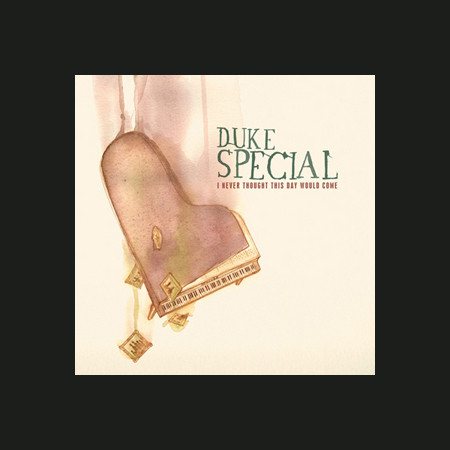 In a deliberate attempt to push outwards, Duke Special undertook many writing collaborations for this album including sessions with Daniel Benjamin - drummer with German punk band Jumbo Jet, Paul Pilot, Phil Wilkinson and Bernard Butler. The wind, brass and percussion of the RTE Symphony Orchestra, under the stewardship of the inimitable David Brophy, add a swirling carnival flavour to the proceedings.